Buy Frozen Cakes & Desserts With Delivery — Riverport Trading, home of high-quality, ethically sourced specialty foods from Europe! *Actual product packaging and presentation may differ from that shown on the website. A chocolate sponge cake filled with delicate cream cheese cream, and juicy peach, raspberries, and strawberries. “Prague” is a classic delicate moist chocolate sponge cake layered with boiled condensed milk cream and light tart cherry jam. Light chocolate sponge cake with condensed milk and cream cream, and juicy cherries. 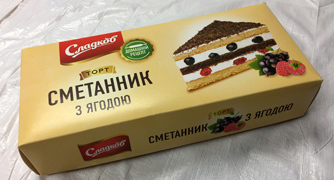 A combination of sour cream and chocolate sponge biscuits with sour cream and juicy cherries. Traditional classic sour cream cake with light sour cream cream and berries. Please Sign Up for our Newsletter and get the latest news on Products from Riverport Trading. We respect your privacy. Any and all information collected at this site will be kept strictly confidential and will not be sold, rented, loaned, or otherwise disclosed. ©2017 Riverport Trading Ltd. Branding & Website Design by Daoutova Creative.